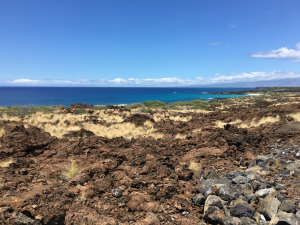 On August 3rd, the ATom mission moved on from Alaska to Kona, on the big island of Hawai’i. 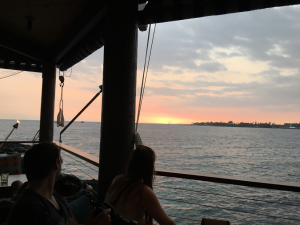 The schedule allowed for two days on the ground in Kona, and for many of the crew, this allowed a much welcome day off. Although the tropical locations that ATom will visit are beautiful, they do lead to some logistical challenges. When the aircraft is on site for “ground day”, we often will run our instruments all day to keep them in top working order. However, our instruments, and the associated heavy-duty vacuum pumps throw off a lot of heat. Combine the heat from instruments with the heat of a metal airplane sitting in the sun on the hot tarmac, this can lead to excessive temperatures in the cabin and so it is imperative that we air condition the plane. AC carts are not always available, however, so this severely restricts our ability to run on the ground in the tropical locations. In Kona, we were able to work out limited usage of the AC cart from Hawaiian Airlines. In Samoa, we will not have AC. Of course, in the cold locations (Christchurch and Punta Arenas), we have the opposite problem! Our instruments don’t like to be too cold either, so leaving the plane outside in freezing overnight temperatures can lead to any water in our instruments freezing and also to very long warm up times in the morning. Our logistics crews are now working hard trying to figure out how to heat the plane outside overnight when it arrives in Christchurch on August 9th. 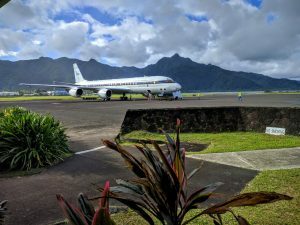 Yesterday, ATom completed a successful transit to Pago Pago, American Samoa. There is one scheduled ground day in Samoa before heading to Christchurch, New Zealand. Christchurch is our major resupply stop where we will refill consumables (such as compressed gases and dry ice), and many of our researchers will swap out with their team members who will continue on the second half of the voyage. I am currently in Christchurch awaiting the arrival of the aircraft. In a couple of days, I will be swapping out with Jeff Peischl before heading out to Chile and then onward to the Atlantic leg of the mission.